PURPOSE: To make additional journal entries to the General Ledger other than through the subledgers. INTRODUCTION: Entering manual journal entries for reclassification, payroll, and miscellaneous, etc. transactions. 1. Navigate to the Find Journals form. 2. Double click on Enter or click on Open button. 3. Find Journal Screen should open. 2. New Journals form should open. 1. In the Journals window, enter a unique Journal name for the entry. If you do not enter a journal name, General Ledger automatically assigns a name using the following format: Source Journal ID Date. 2. (Optional) Enter a Description for the journal entry. General Ledger uses this as the default description for each journal entry line. You can change the journal entry description as necessary. 7. Balance Type is a display - only field. 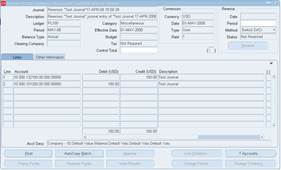 It displays Actual when you are entering actual journals and Budget when you are entering budget journals. 9. Enter a Control Total if you want to verify the total debits for the journal lines against the journal control total(Optional). 12. Select the Lines tab and enter the journal lines. (Optional) Select the Other Information tab to enter optional reference information about the journal entry. Enter a Journal Reference Date. The primary function of this field is to satisfy Libro Giornale Requirements in Italy, but it can be used for any other date information that you want to store at the journal header level. If you are using Reporting Currencies (Journal or Subledger Level) and you enter the Reference Date in the journal in your source ledger, it is also transferred to the journals of the reporting currencies. If the profile option Enter Journals: Validate Reference Date is set to Yes, the date you enter is validated to ensure the date falls into an open or future enterable period. If the profile option GL Consolidation:Preserve Journal Batching is set to Yes for the parent ledger,the consolidation process transfers the reference date information from the subsidiary ledger to the parent ledger. 1. 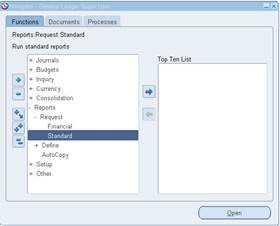 Enter a Line number for each journal line to control the sequence in which the journal entry lines appear online and in reports. After you enter the first journal entry line number, General Ledger automatically increments the numbers for the following lines. You can change the line numbers as necessary. 3. Enter the Debit or Credit amount for the designated account. Note: If needed, you can enter debits and credits as negative amounts. 4. Description will default in from the header information. You can change if required. 5. Use down arrow to start new line. The line number should be created automatically for you. You can change it if required. Repeat above steps until completed with the journal entry. PURPOSE: To provide instructions for modifying a journal entry. INTRODUCTION: If the journal entry has not posted, account numbers can be changed, amounts changed, and lines added or deleted. 1. Navigate to the Find Journals Screen. 1. Find the journal entry which you want to modify by entering the search criteria into the appropriate area. 2. Click on the Find button. 3. Enter Journals Screen will appear with all journals meeting criteria listed. All journals which have not been posted can be modified. 1. Select the Journal you want to modify by using arrow keys or clicking on the journal entry line. 2. Double click on the line or click on the Review Journal button on the bottom of the form. 3. The Journals Screen (journal entry detail screen) will be displayed. 1. Make your changes to the journal entry. · Save button on the tool bar. PURPOSE: To provide instructions for deleting a journal entry. INTRODUCTION: If the journal entry has not posted, the journal entry can be deleted if entered in error. The Delete Records feature will delete the journal or batch. This is a quick and effective way of permanently removing journals. Be sure to save the changes when prompted. 1. Find the journal entry which you want to delete by entering the search criteria into the appropriate area. All journals which have not been posted can be deleted. 1. You will be asked whether you want to delete only the journal or the whole batch. 2. Click on the appropriate response. 3. When this is completed, select Save from the Action menu or the Save button on the Toolbar. 4. 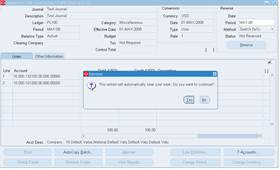 The dialogue line on the Toolbar will then display confirming message that the transaction has been saved. 5. This completes the process. If you requery on the Find Journal screen, the deleted journal entry will not appear for selection or be available for selection on the post screen. PURPOSE: To provide instructions for posting a journal entry. INTRODUCTION: Once journal batches and/or entries have been reviewed and approved, the entry(s) can be selected for posting from the Post Journals form. Review the Post Status and Period Status of the entry to determine that it is available for posting. In addition, you can post a journal by choosing the Post Button form the More Actions window when reviewing a journal online. Journals can only be posted to open periods. When you post to an earlier open period, actual balances roll forward through the latest open period. If you post a journal entry into a prior year, General Ledger adjusts your retained earnings balance for the effect on your income and expense accounts. Suggestion: Run a Trial Balance Report whenever you post to a previous fiscal year to ensure that your Retained Earnings account is properly reconciled. The Posting process creates a Posting Execution Report, which should be reviewed to determine whether any errors occurred. You can automate your posting process by scheduling the Automatic Posting program to periodically select and post batches. 3. Find Journal Batches Screen should open. 1. 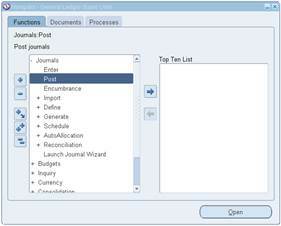 Find the journal entry which you want to post by entering the search criteria into the appropriate area. 3. Post Journals Screen will appear with all journals meeting criteria listed. 1. A list of journals/batches will display. 2. Select the journal(s)/batch(es) to be posted. 3. Click on the check box on the left hand side to mark the journal(s)/batch(es). The designated row will become highlighted. 4. Click on the Post button. 1. Click on the OK button when the concurrent ID number displays. Make note of process number for future use. 2. The system then returns to Find Journal Batches form. The Posting process creates a Posting Validation Report which should be reviewed to determine whether any errors occurred. If any journal/batch could not be posted, the report tells you if posting discovered errors in the journal header or the journal lines. All errors must be fixed before the journal/batch containing the error journal can be resubmitted for posting. Further details on the posting status can be obtained by reviewing the journal/batch in either the Post Journals or Enter Journals forms. If a journal/batch could not be posted, the error status will be displayed. Once a batch has been posted, print the Journal Lines Report for the posted batch and attach it to unposted Journal Lines Report printed earlier (see detailed journal entry processes). The journal batch should then be filed by year/month and alphabetically by batch name, to facilitate future inquiry and audit. PURPOSE: To provide instructions for defining reversing journals. INTRODUCTION:. Use reversing journal entries to reverse accruals, estimates, errors or temporary adjustments and reclassifications at the time the original journal is entered. Existing journals can also be reversed to correct errors. 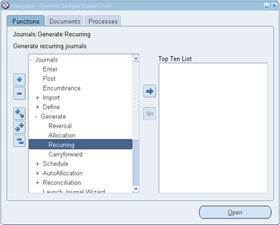 Assign a reversal period to a journal entry if you want to generate a reversing entry from the Enter Journals window. You can enter a reversal period at any time, even after the journal is posted. However, you cannot reverse batches and journals that you have already reversed. You can also reverse a journal or batch from the Enter Journals window, even if you have not assigned a reversal period and effective date. 3. Find Journals Screen should open. 1. Find the journal entry which you want to reverse by entering the search criteria into the appropriate area. Just click on Find for all journals. Select the Journal you want to reverse by clicking on it or using the arrow keys. 1. The journal entry detail screen will be displayed. 2. In the Reverse region, select a period from the Period list of values for the reversing entry. 3. In the Reverse region, select a reversal method from the Method drop-down list. Once you enter the effective date, reversing period, and reversal method, the journal entry is marked for reversal . Click on the Reverse Button. A confirmation message box appears and click on the Yes button. A concurrent request gets submitted and note down the concurrent request id. After the concurrent program completes , the journal entry will have a status of Reversed. 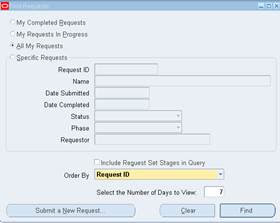 Query in the journal entry screen to find the Unposted reversal journal entry. Review the reversal journal entry and post it. PURPOSE: To provide instructions for defining allocation journals. · standard costing, where you want to allocate costs based on standard costs of a statistical unit. 2. Select balance type: Actual. 1. Enter the Name, Category, and Description of the MassAllocation formula. Categories help you group journal entries in a convenient manner for reporting and analysis. 2. Enter the Currency for the MassAllocation journal entry. You can choose a ledger currency, or an entered or STAT currency. 3. Choose your Foreign Currency Allocation method to determine how you want entered currency balances converted. If you choose Converted Amount, General Ledger allocates the full balance for the account for both the entered and converted amounts for foreign currency allocations. If you choose Calculated Amount, enter a Conversion Type, except for the User rate type. 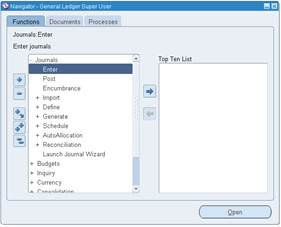 General Ledger uses the entered conversion method, conversion type, and journal effective date to determine the rate to use to convert the generated MassAllocation journal. 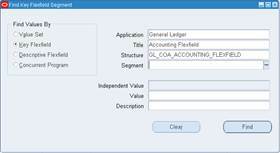 General Ledger uses the following format to represent the equation. Each factor in this equation relates to a separate formula line. A * B / C You can enter any combination of fixed amounts and accounts in formula lines A, B, or C.
Enter the account for the A, B, or C line of your formula. Enter accounts with parent segment values to create a formula that references accounts with the corresponding child segment values. 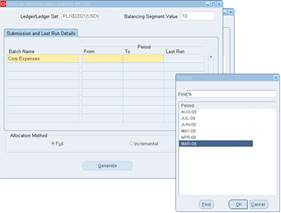 Optionally, enter a ledger, ledger set, or balance-level reporting currency in the Ledger segment or a balancing segment value in the balancing segment for the accounts for lines A, B, or C. By leaving these segments blank, you can use the MassAllocation formula for different ledger sets, ledgers, or balancing segment values by indicating them at generation time. 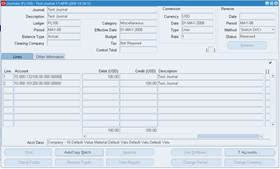 When you enter an account, General Ledger ensures that segment values are valid and enabled. For the ledger segment value, you can define formulas with ledgers or ledgers sets that have the same chart of accounts as your current responsibility's data access set. Constant (C): Assign this type to a single ledger segment value. 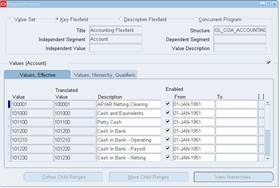 You can only use this segment type for a single ledger for the ledger segmentAssign this type to a child segment value to use the detail account balance associated with the child. You can use this type with a parent segment value only if there is a summary account associated with the parent. Note: To use summary accounts in a mass allocation formula, all segments in the formula must be assigned a segment type of Constant. Defaults to the currency of the ledger currency or balance-level reporting currency and cannot be changed. 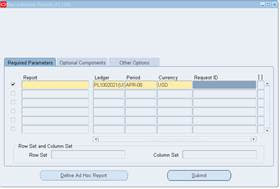 Can be a currency of a ledger or an associated balance-level reporting currency within the ledger set. 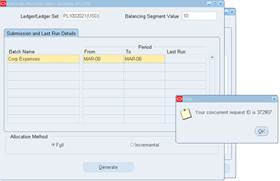 The ledger currency for formula lines that use the Encumbrance balance type should be the ledger currency of the specified ledger set or ledger. 7. 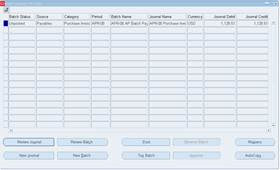 Enter a Currency Type of Entered, Statistical, or Total. If the balance type of the formula line is Encumbrance, you can only select the Total currency type since only total balances is supported for encumbrance balances. 8. Choose an Entered Currency. If the specified currency type is Statistical, the entered currency default is the statistical currency and cannot be changed. If the specified currency type is Total, the entered currency field is disabled. If the specified currency type is Entered, the entered currency can be any currency. The Ledger Currency, combined with Currency Type and Entered Currency fields, determines what type of currency account balance is retrieved for your formula. 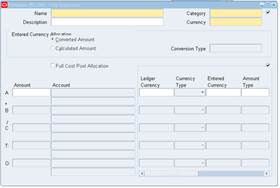 The following table shows the currency account balance types for each combination of the ledger currency, currency type, and entered currency. 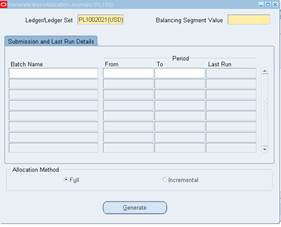 Entered Balance of the entered currency for the ledger referenced from the ledger currency. Statistical balance of the ledger referenced from the ledger currency. Total balance of the ledger currency for the ledger referenced from the ledger currency. The ledger currency of the ledger or of the ledgers in a ledger set indicated at generation time must be the same as the specified ledger currency to have a MassAllocation journal generated. The ledger cannot be a balance-level reporting currency. 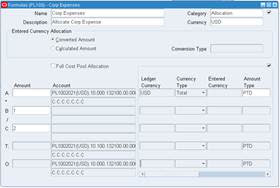 Total balance of the ledger currency or balance-level reporting currency from the ledger or balance level reporting currency referenced from the ledger currency. The ledger currency of the ledger, the ledgers in a ledger set, or the balance-level reporting currency indicated at generation time must be the same as the specified ledger currency to have a MassAllocation journal generated. 11. 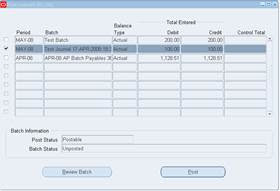 Enter the account Balance Type to use for the formula line. If you enter the Budget balance type, you must also enter a Budget name. If you enter the Encumbrance balance type, you must also enter an Encumbrance Type. PURPOSE: To provide instructions to generate allocation journals. INTRODUCTION: Generate MassAllocations to create unposted journal batches based on your validated MassAllocation formulas. The generated journal batch contains one entry for each allocation formula in the batch. Use MassAllocation journals to reverse existing balances, post new allocation amounts, or generate journals that increment the existing balances to match the current allocation amount. You can generate MassAllocation journal batches for any range of open or future enterable periods. General Ledger creates one unposted journal batch for each period in the range. If there is a closed period in the range of periods you specify, General Ledger generates a batch that cannot be posted until you open the period. 1. 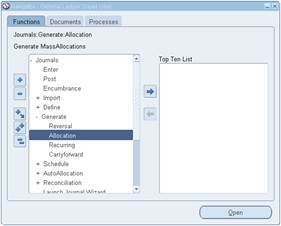 Navigate to the Generate MassAllocation Journals form. 2. Double click on Allocation or click on Open button. 3. Generate MassAllocation Journals form should open. 1. 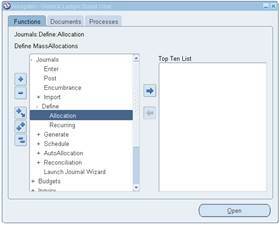 Navigate to the Generate MassAllocation Journals window. 7. Enter the Batch Name for each validated MassAllocation formula batch you want to generate. 11. (Optional) Schedule your Allocation or MassAllocation batch. 12. Choose Generate to submit a concurrent process that creates an unposted journal batch for the period you specify. 14. Review and change the generated MassAllocation journal batches using the Enter Journals window. General Ledger names your MassAllocation journal batches as follows: MB: <Request ID> <MassAllocation Batch Name> <Period>; for example, MA: 47566 Rent Budget Allocation JAN-08. The Conversion region in the header of the Enter Journals window displays the conversion information for your MassAllocation journal. The table below details how your generated MassAllocation journals are displayed. The daily rate between the entered transaction currency and the ledger currency for the journal effective date and conversion rate type. The conversion rate used to calculate the accounted amount is the daily rate between the entered transaction currency and the ledger currency. 15. 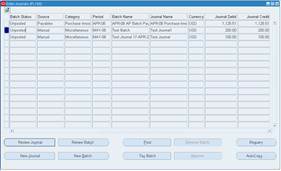 Post the MassAllocation journal batches using the Post Journals window. PURPOSE: To provide instructions for defining recurring journals. INTRODUCTION: Define recurring journal formulas for transactions that you repeat every accounting period, such as accruals, depreciation charges, and allocations. Your formulas can be simple or complex. Each formula can use fixed amounts and/or account balances, including standard, end-of-day, or average balances, actual or budget amounts, statistics, and period-to-date or year-to-date balances from the current period, prior period, or same period last year. You can quickly create new recurring formulas by copying and modifying existing formulas. You can define single ledger or multiple ledger recurring journal formula batches. For the multiple ledger batch type, you can create a recurring journal formula batch that contains recurring journal entries for different ledgers. You can define recurring journal formulas for your ledger currencies, entered currencies, and statistical currency. · Skeleton Journal Entries: Skeleton entries affect the same accounts each period, but have different posting amounts. After you generate skeleton journal entries, you can edit the unposted journal batch using the Enter Journals form and enter the journal line amounts. · Standard Recurring Journal Entries: Standard recurring journal entries use the same accounts and amounts each period. · Recurring Journal Formula Entries: Formula entries use formulas to calculate journal amounts that vary from period to period. To define a recurring journal formula entry, you must create a recurring journal formula batch. Your batch can contain a single recurring journal entry definition, or you can group related recurring journals into the same batch. 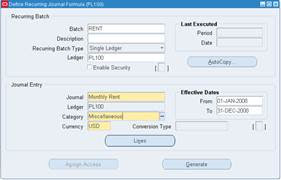 • Single Ledger Recurring Journal Formula Batch: Single ledger batches affect only one ledger in the batch. • Multiple Ledger Recurring Journal Formula Batch: Multiple ledger batches can affect multiple ledgers in the batch. You can define recurring journal formulas across ledgers. Note: You can only define single ledger batch types for budget formulas. You can create recurring journal formula batches that include ledgers that have the same chart of accounts, calendar, and period type as the data access set of your current responsibility. When you generate the recurring journal formula batches, you must have read or read and write access to the ledger and balancing segment value or management segment value to generate recurring journals. If you use reporting currencies (journal or subledger level), you can create recurring journal formula batches for single reporting currencies or multiple reporting currencies. 1. Navigate to Define Recurring Journal Formula form. 3. Define Recurring Journal Formula form should open. 1. Enter a Name and optional Description for the recurring journal batch. 2. Choose a Recurring Batch Type. Note: You can only choose the single ledger batch type for budget formulas. 3. If you chose a single ledger recurring batch type, enter the name of the ledger. For a multiple ledger batch type, the Ledger field is disabled. 4. 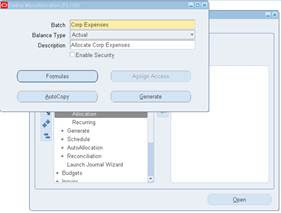 If you want to copy entries from an existing recurring journal batch to your new batch, choose AutoCopy Batch. 5. Create recurring journal entries for the batch. If you copied entries, modify them, if necessary. 6. (Optional) Select the Enable Security checkbox to apply Definition Access Set security to your recurring journal definition. Definition Access Sets are an optional security feature that allows you to control access to your General Ledger definitions. 7. Enter a range of Effective Dates that includes only those periods for which you want the recurring journal entry to be used. Attention: Recurring journal entries will only be created when you choose to generate them for a date that falls within the Effective Dates range. 8. Click on Lines button to enter the account you want General Ledger to update when you generate your recurring journals, as well as the formula to use. 1. Enter a Line number to set the order of your recurring journal entry lines. You can indicate an automatic offsetting line for your recurring journal entry by entering the line number 9999. Recommend that you use, at a minimum, increments of 10. 2. Enter the Account you want General Ledger to update when you generate and post your recurring journals. 3. Enter an optional Line Description for the recurring entry line. 4. Enter a Formula for the line. 5. Enter the remaining lines for the recurring journal entry. Remember that you can use line number 9999 as the automatic offsetting line for each recurring journal entry. You can enter a recurring journal entry line and have General Ledger calculate and insert the balancing amount for the recurring journal entry automatically. This is useful for allocation-type entries. · Enter 9999 as the line number for the automatic offsetting line. · Enter an Account for the line but do not enter a formula. General Ledger will automatically calculate the amount for this journal entry line when you generate your recurring journal. 1. Enter a Line number to set the order of your recurring journal entry lines. 2. Enter the Account you want General Ledger to update when you generate and post your recurring journals. Do not enter a formula. 3. Enter the remaining lines and accounts for the recurring journal entry. 1. Generate the recurring journal batch that contains your skeleton entry. 2. Edit the unposted journal batch using the Enter Journals window, and enter the journal line amounts. 3. Save the revised journals. PURPOSE: To provide instructions to generate recurring journals. · INTRODUCTION: . You must generate recurring journals to create unposted journal entries from the recurring journal formulas you defined. After generating the formulas, you can review or edit the recurring journal batches before posting them. · Define your recurring journal entry formulas. 1. Navigate to the Generate Recurring Journals form. 2. Double click on Recurring or click on Open button. 3. Generate Recurring Entries form should open. 1. Select the Recurring Batches you want to generate. 2. Enter the accounting Period for which you want to create an unposted journal batch. The default is the first open accounting period following the one for which you last generated recurring journals. LOV available. 4. Click on Generate button. 5. 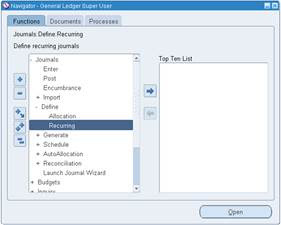 General Ledger submits a concurrent process to create unposted journal batches based on the selected recurring journal formula batches. Note the Request ID assigned to the concurrent process. 6. General Ledger names the resulting journal batch as follows: <Recurring Batch Name>: <Date> <Time>. For example, RENT: 15-JAN-08 16:36. 7. If you generated skeleton journal entries, use the Enter Journals window to complete the journal information. 8. Post the generated recurring journal batches to update account balances. PURPOSE: To provide instructions for submitting standard reports. INTRODUCTION: General Ledger gives you a complete set of standard reports such as journal reports, general ledgers, account analyses and trial balances. You can also request standard listings to review key non-financial information, including your chart of accounts, row sets, column sets and content sets, reporting hierarchies, consolidation definitions, recurring journal formulas, and more. All of the information in these reports and listings is also available online. You can combine standard reports, listings and programs into a request set to submit them as a group. In addition, if the Financial Statement Generator program is assigned to your responsibility, you can include FSG reports in standard request sets. 2. Double click on Standard or click on Open button. 3. Submit a New Request form should open. 1. Select Single Request or Request Set option. 2. Click on OK button. 3. Submit Request should open. 1. 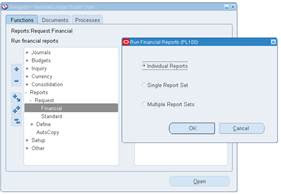 Select the report to run at the Request Name option. LOV is available to find the report. 2. 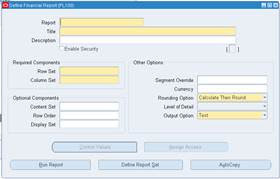 Entert the appropriate parameters for the report you wish to run. LOV is available for the majority of parameter options. 3. Click on Completion Options button to review or change printer, number of copies, forward options, and save options. 4. Submit the report by clicking on the Submit Request button. · When you submit the request the form should appear. · From any screen, under the Help Menu option, click on View My Requests option. · From the Navigator screen, Other -> Requests. 1. The Find Request form should open. 2. Enter parameters if you wish to select specific requests or click on the Find button if you want to review all request. 3. The Request form should open. You can review all of your requests at the same time, or you can review only certain requests, based on the Request ID, phase or status you specify. General Ledger provides detailed information about your request, including request time, start time, report options, priority, status and much more. 1. This is the Request (the Concurrent Manager Screen) form. It can be refreshed to view the current status. Click on the Refresh Data button to update the current requests. 2. The status of the request(s) is displayed and updated when the screen is refreshed or redisplayed. 3. When the job is completed, the output (report) can be viewed by clicking on the View Output button. 4. The log produced by the request (useful if errors are encountered), can be seen by clicking on the View Log button. PURPOSE: To provide instructions how to create and run FSG’s. INTRODUCTION: Financial Statement Generator (FSG) is a powerful report building tool for Oracle General Ledger. · Generate financial reports, such as income statements and balance sheets, based upon data in your general ledger across a ledger set or a ledger. · Generate presentation quality financial reports with XML Publisher so that you can have more control with report formatting options, including changing font characteristics, inserting graphical images or logos, and adding color. · Define segment value security rules to restrict financial information contained in FSG report output generated by specific users and responsibilities. · Enable definition access set security to allow specific reports or report objects to only be used, viewed, or modified by certain users. · Define your reports with reusable report objects, making it easy to create new reports from the components of reports you've already defined. You can also define your reports to be reusable for different ledgers or ledger sets by specifying the ledger or ledger set at report generation time as opposed to in the report definition. · Define your reports with reusable report objects, making it easy to create new reports from the components of reports you've already defined. 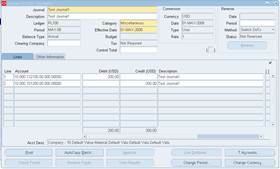 · Design custom financial reports to meet specific business needs. · Print as many reports as you need, simultaneously. · Print the same report for multiple companies, cost centers, departments, or any other segment of your account structure, in the same report request. · Schedule reports to run automatically. · Produce ad hoc reports whenever you need them. 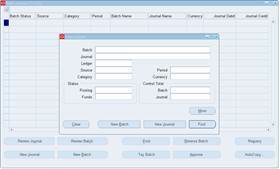 · Print reports to tab-delimited files for easy import into client-based spreadsheet programs. In addition, you can use the Report Wizard feature of GL Desktop Integrator to design and submit your financial reports, as well as view the results, directly from a spreadsheet. 1. Navigate to the Row Set form. 2. Double click on RowSet or click on Open button. 3. Row Set form should open. 1. Enter in the Name of the row set. Do not use the ampersand (&) symbol in your Row Set name. 2. Enter in the Description of the row set. 3. 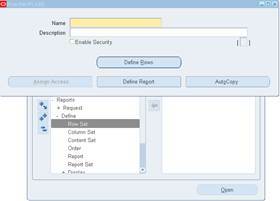 (Optional) Select the Enable Security checkbox to apply Definition Access Set security to your row set definition. Definition Access Sets are an optional security feature that allows you to control access to your General Ledger definitions. For example, you can prevent certain users from viewing, making changes, or using your row set. If you do not enable security, all users will be able to use, view, and modify your row set. 4. Click on the Define Rows button. 1. Allocate a Line Number for this row. (Suggestion: Leave space so that you can add additional lines in between those you create now. ie: 10,20,30, etc.). 2. Enter a Line Item (this is what will appear on the report for this row, ie: REVENUE). 3. Tab through Format Options and enter information where you wish. 4. Optionally enter the Advanced and Display Options fields. 5. Click on the Account Assignments button if a detail line. Otherwise, use down arrow key to begin a new line if header only. 1. Select a mathematical Sign ( + or - ) to tell FSG whether to cumulatively add or subtract the balances for each account in the specified account range. To use this feature, each segment in the range must be defined with a display type of T (Total). 3. Enter the range of values of the accounts to include. Note: To specify just one account rather than a range, enter the same account as the Low and High. If you leave an account segment blank, FSG will process all values for that segment. 4. Enter a Display type for each account segment. Note: You must use a display type of T (Total) for each segment if you assign: A ledger/ledger set or accounts to a column. Note: FSG does not support expanding across a ledger set within a single column. If you want to report on a ledger set across columns, you must explicitly specify the ledger or reporting currency to report on in each column. Note: FSG does not support expanding across a ledger set within a single column. 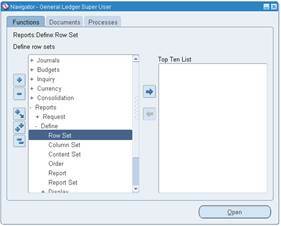 If you want to report on a ledger set across columns, you must explicitly specify the ledger or reporting currency to report on in each column. 5. 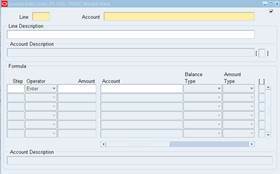 Check the Summary checkbox if you want to report only summary balances for the accounts in the specified range. 6. 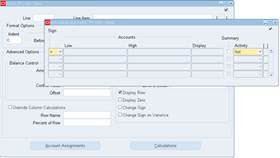 Select an Activity type (Dr, Cr or Net) to specify the types of balances to use for the accounts in each account range. 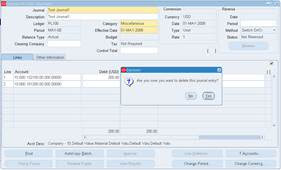 For example, enter Dr or Cr if you want to define a cash flow report or a statement of changes in financial position. For these types of reports, you may need separate rows or columns for debit and credit amounts. 7. Click on Action Save from the pull down menu or the Save button on the toolbar. 8. When you want a calculated line, you have to click on the Calculations button. 1. 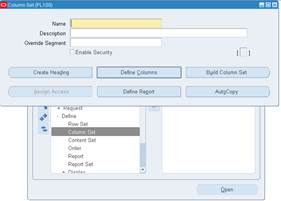 Navigate to the Column Set form. 2. Double click on ColumnSet or click on Open button. 3. Column Set form should open. 1. Enter in the Name of the column set. 2. Enter in the Description of the column set. 3. (Optional) Enter an Override Segment. 5. Click on the Define Columns button. 1. Enter a Position for this column to appear on the page. 2. Enter a Sequence number if required to be used in the calculations. 3. Enter a Format Mask. 4. Enter a Factor if required (LOV). 5. Enter an Amount Type (LOV). 6. Enter the Currency (LOV). 7. Enter a Offset (period) if required for this column (eg –1 means 1 period before the period the report is being fun for). 8. Enter any Advanced or Display Options as required. 9. You may also enter calculations or accounts assigned to columns, if required. 9. When complete, click on Action Save from the pull down menu or the Save button on the toolbar. 1. 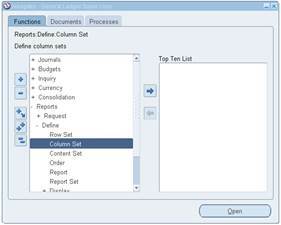 To create your report and to assign it the row set and column set, Navigate to the Report form. 2. Double click on Report or click on Open button. 3. Define Financial Report form should open. 1. Enter in the Name of the report. 2. Enter in the Title of the report. The report title is what FSG will print at the top of the report. 3. Enter in the Description of the report. 6. (Optional) Enter the Content Set, Row Order, and/or Display Set to use for the report. 7. (Optional) Enter Segment Override values for the account segments you want to override. 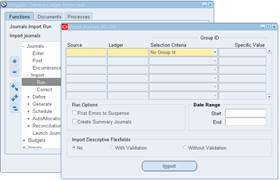 When you enter a segment override value, FSG produces a report for the specific value you specify. 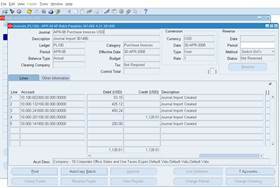 For example, assume you have a report definition which produces a combined assets report for four companies. If you modify the report definition to add a segment override for company 02, then FSG will print an assets report for company 02 only. Note: If a segment you override is subsequently disabled, the Segment Override definition becomes invalid and you must redefine your report. 8. (Optional) Enter a default Currency for the report. FSG uses this currency only for those rows and columns to which you did not assign a currency when you defined row and column sets. 9. (Optional) Select a Rounding Option to use for calculations in the report (LOV). 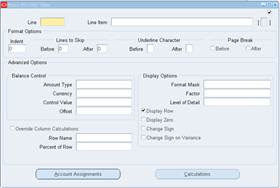 · Calculate Then Round: FSG performs calculations before any rounding. · Round Then Calculate: FSG rounds values before they are used in calculations. 10. (Optional) Select a Level of Detail for the report. There are three options, which correspond to the levels of detail you can assign to rows and columns. If you specify a level of detail for your report, FSG will only print those rows and columns with matching levels of detail. Note: If you do not enter a level of detail for a report, the system will assume the level of detail is Financial Analyst. · Text: Produces a report in standard text form (no tab-delimited columns). If you download the report to a spreadsheet, you must manually parse the report columns. The default is Text. · Tab-Delimited: Produces a report whose columns are delimited by tabs, making it easier to import the report into a spreadsheet. · Spreadsheet: Produces a report designed specifically for downloading to GL Desktop Integrator. 10. Save your work, click on Action Save from the pull down menu or the Save button on the toolbar. 12. Choose Run Report if you wish to run report at this time. 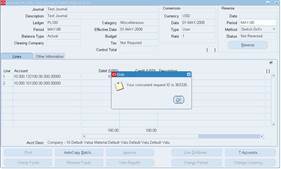 A dialogue box will display telling you that the transaction is complete. Click OK.
PURPOSE: To provide instructions for submitting financial (FSG) reports. INTRODUCTION:. 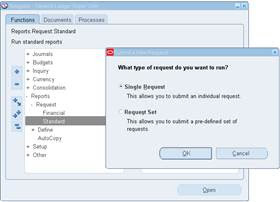 To generate FSG reports you must request that FSG run them. You can request an individual report, all or part of a report set, or several report sets. If you request an individual report, you can either run a predefined report or request that FSG run an ad hoc report. 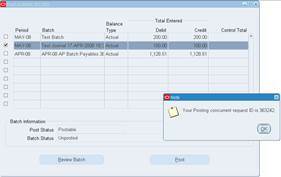 For ad hoc reports, you select report objects and other report parameters during the report submission process. When you request a predefined report, you can either run the report with the parameters you saved in the report definition, or you can change the parameters at runtime. However, if you change the parameters at runtime, FSG will not save them in the stored report definition. You can also re-use FSG reports and components so that you can run them for different ledgers, ledger sets, or reporting currencies that share the same chart of accounts by specifying the ledger parameter at run time. 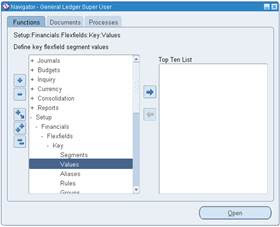 The ledger value you specify fills in as the ledger parameter should this not be specified in the report definition. You can request reports from the Run Financial Reports window or through standard request submission (Submit Requests window). The advantage of requesting reports through standard request submission is that you can schedule the reports to run automatically. You can also combine FSG reports with standard reports, listings, and programs. The disadvantage is that you cannot run report sets through standard request submission. To publish FSG reports using XML Publisher, you must run the FSG program to generate your FSG report in XML output and then run XML Publisher to apply the layout and formatting of a report template to your FSG report. You can do this from the Run Financial Reports window or from the Submit Requests window. You can also generate the XML output and publish your FSG report's XML output through the Submit Requests window from a single submission request. After your FSG report has been published the first time, you can republish your FSG report using a different report template to acquire a different look for the same financial report without having to run the FSG program again to create the XML output. 2. Double click on Financial or click on Open button. 3. Run Financial Reports form should open. 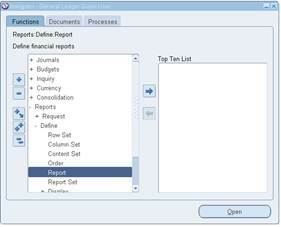 Note: You can also choose the Run Report button from the Define Financial Report window. 1. Choose Individual Reports from the list. 3. Enter your report parameters. 6. Submit Request should open. PURPOSE: To provide instructions on how to import journals into the General Ledger. INTRODUCTION: Use Journal Import to integrate information from other applications such as payroll, accounts receivable, accounts payable and fixed assets with your General Ledger application. For each accounting period, you can import accounting data from these feeder systems, then review, update and post the journal entries. 2. Double click on Run or click on Open button. 3. Import Journals form should open. 3. You can import data for the same or different sources in parallel by specifying a unique Group ID for each request. 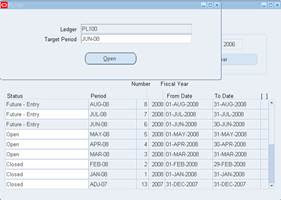 General Ledger imports data with the journal entry source and group ID combination you specify. If you do not specify a group ID, General Ledger imports data from the specified journal entry source with no corresponding group ID. 4. Define the Journal Import Run Options. 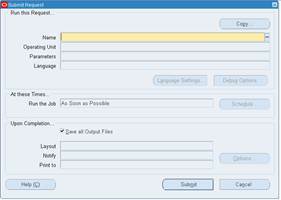 5. select an option for Import Descriptive Flexfields . 6. Enter a Date Range to have General Ledger import only journals with accounting dates in that range. If you do not specify a date range, General Ledger imports all journals data. 7. Click Import to submit a concurrent process to import journals. 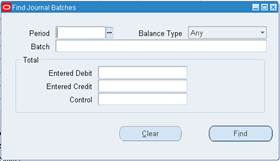 General Ledger names the resulting batch as follows: <REFERENCE1> <Source> <Request ID>: <Actual Flag> <Group ID>; for example, 587-C Payables 18944: A 347. 1. Review the Journal Import Execution Report to determine the number of errors in the import data, and how to correct any Journal Import errors. 2. If you have only a few Journal Import errors, correct the errors from the Correct Journal Import Data widow, then rerun Journal Import on the corrected data. 3. If the number of Journal Import errors is high, delete all of the import data for your journal entry source and group ID. Correct the errors then repopulate the GL_INTERFACE table before rerunning Journal Import. PURPOSE: To provide instructions on how to add/change/disable segment values of the accounting flexfield. 2. Double click on Values or click on Open button. 3. Find Key Flexfield Segment form should open. 1. 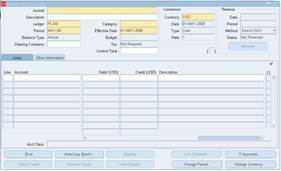 Enter Application = Oracle General Ledger or use LOV to select that option. 2. Use LOV to default in the Title. 3. Use LOV to default in the Structure. 4. Use LOV to select the segment (company, account, department, or product line) which you want to maintain. 5. Enter in Value of segment if applicable. 6. Click on Find to bring up all values or selected values. 1. To edit or disable a value, click on the value. 2. Edit or disable value. 3. To add a value, click on value line. 4. Click on Add button on toolbar (Green Plus box). 6. Save your work, click on Action Save from the pull down menu or the Save button on the toolbar. PURPOSE: To provide instructions on opening, closing, and reopening General Ledger accounting periods. INTRODUCTION: Open and close accounting periods to control journal entry and journal posting, as well as compute period- and year-end actual and budget account balances for reporting. · Open: Journal entry and posting allowed. · Closed: Journal entry and posting not allowed until accounting period is reopened. Reporting and inquiry allowed. · Permanently Closed: Journal entry and posting not allowed. You cannot change this period status. Reporting and inquiry allowed. · Never Opened: Journal entry and posting are not allowed. General Ledger assigns this status to any period preceding the first period ever opened in your calendar, or to any period that has been defined, but is not yet future-enterable. You cannot change this period status. · Future-Entry: Journal entry is allowed, but posting is not. Your period is not yet open, but falls within the range of future-enterable periods you designated in the Set of Books window. You cannot change this period status without using the concurrent process to open the period. You can open new accounting periods, close accounting periods, and reopen closed accounting periods. 1. Navigate to the Open and Close Periods form. 2. Double click on Open/Close or click on Open button. 1. Choose a Ledger from the list of values. 2. Choose the Period Status of the periods you want to find. Any is the default to indicate any period status. 3. 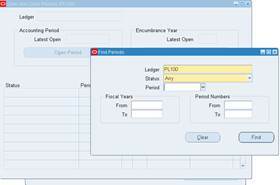 (Optional) Specify a Period, Fiscal Years, or Period Number to find specific periods for the ledger. If you leave these fields blank, all periods are retrieved. 1. 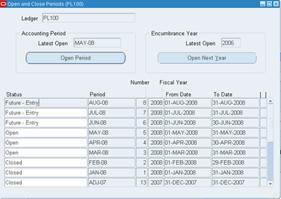 General Ledger displays the Latest Open accounting period. Note that while a period may be the most recently opened accounting period, this period may have a current status of closed. 2. Click on Open Period. Suggestion: Although you can have several open accounting periods, to maximize the efficiency of the General Ledger posting process, as well as to minimize the possibility of user error, limit the number of accounting periods that are open at one time. Note: If you open the first period of a new fiscal year, General Ledger automatically updates the Retained Earnings account. 3. A window with fields , ledger and Target Period will appear. 4. Give the value for the Target Period and click open. 5. Decision form will appear to continue the open period process. 1. Click on the Yes if you wish to continue the process. If you want to terminate the process, click on No. 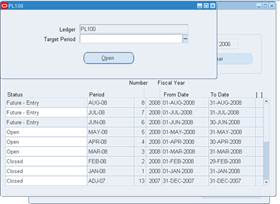 General Ledger calculates the ending account balances for the current period, and launches a concurrent process to open the next period. The current period remains Open. 2. If you selected Yes, a note box will appear with your concurrent ID assigned. If No selected, you will be returned to the Open and Close Periods form. 1. Click on OK and the next period will be opened after the concurrent process is completed. 3. The Find Periods window appears. 2. 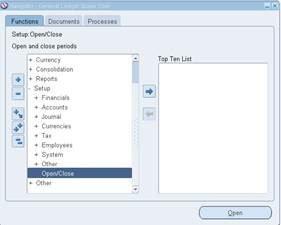 Select the open period that you want to close by clicking on the Period or arrowing to the appropriate Period. 3. Enter a new Status for the period using the LOV. · Enter Closed to prevent entering or posting journals to that period. You can reopen a closed period at any time. 1. General Ledger displays all accounting periods defined for the calendar. 3. Enter a Open for Status for the period using the LOV. You can reopen any closed period that is not permanently closed. PURPOSE: To provide instructions for closing the month-end General Ledger accounting period. INTRODUCTION: General Ledger should be the last to close, after all feeder systems have transmitted their final entries for the accounting month. However, you will go ahead and open the period for the next month while leaving the current month open. 1. 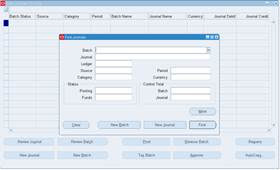 Reverse any accrual type journal entries from the previous period, and post reversals. Each journal entry can be flagged to “reverse”, and if so flagged, the user can specify the period in which it should be reversed. Typically, the reversal is done one period after it is initially posted. 2. Enter final manual journal entries, such as accruals and adjustments and post. 3. 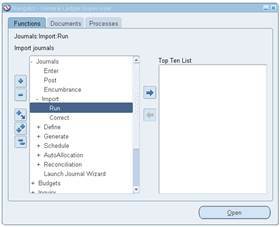 Run Journal Import to load journal entries from feeder systems. Review these transactions using on-line journal inquiry and then post. 4. Generate journal entries for any Recurring journals. Review these transactions using on-line journal inquiry and then post. 5. 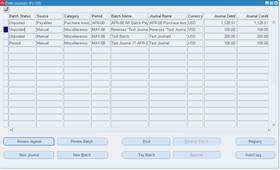 Generate journal entries for any Allocation journals. Review these transactions using on-line journal inquiry and then post. 6. Verify that feeder systems have been closed and all transactions have been imported into Oracle General Ledger. · Account Inquiry or Account Analysis Report. 1. Navigate to the Journals Post form, verify that there are no more journal entries to post for the period you are about to close. If there are journal entries remaining to be posted, you must post them before closing. 2. Close the accounting period in Oracle General Ledger. Select the status “Close”. You may reopen the period if needed to do any adjustments that might be found during the reconciliation process. Period should be closed prior to reconciling to assure that no more “illegal” entries can be passed through without knowledge. 3. Run desired General Ledger month-end reports. 4. 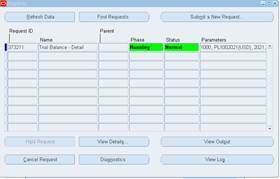 Balance General Ledger to each feeder system using GL reports and feeder system reports. If any error(s) are detected, and additional GL entries need to be posted, “Open” the period again, process the entries, then “Close”.